When I awoke this morning the temperature outside was 37 degrees. Fall is here in Northern Minnesota. The truth is my outdoor autumn decorations are always taken down and packed away for winter right after Halloween. Why? My husband will be deer hunting for two weeks in early November, and many times we have snow during deer season. Last year we hardly had any snow, but we have had major snow storms as early as Halloween. To a colorful harvest pumpkin. To dollar store pumpkins on a black checked runner. A few sunflowers brighten up the patio. And a country scarecrow takes his place in the corner. One side of my covered patio is done. The other side is coming soon. Boy, our winters here in IL don't come that quick. But I am looking forward to winter after this horrible long heat ridden, drought stricken horrible summer. Can you tell I didn't enjoy summer this year :-}. I love you transitioned your porch from summer to fall. 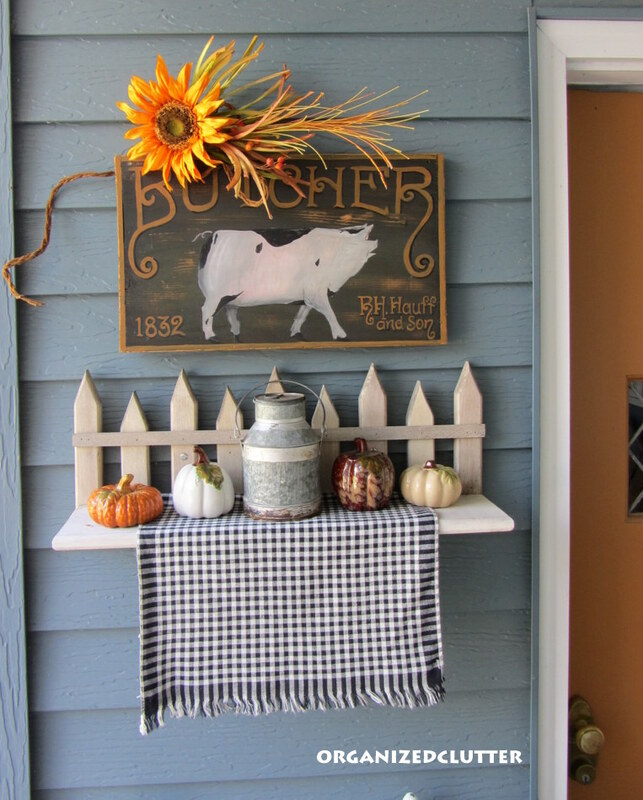 Very pretty and love the scarecrow, but I especially like the "pig" sign. Thanks for sharing your creative inspiration with Sunday’s Best – you helped make the party a success! Boy, it doesn't get to 37 degrees in the winter here but a a couple of weeks. You did a great job on the transition from summer to fall. You inspired me to go do something Fallish! Your porch is so cute! I don't decorate much outside, but maybe I will start!! Love the changing chair. Don't get ever get around to Fall decorating. No one is sure when Fall really is around here. It's pretty much same ole, same ole. Again, I'll just come by and pretend it's cooler and that there are changes by looking at your decorational changes! Very cute. Also very cool. COol here as well and I am so happy. Finally my kind of weather. Of course it will probably be in the 80's this week. Cute, cute Carlene. 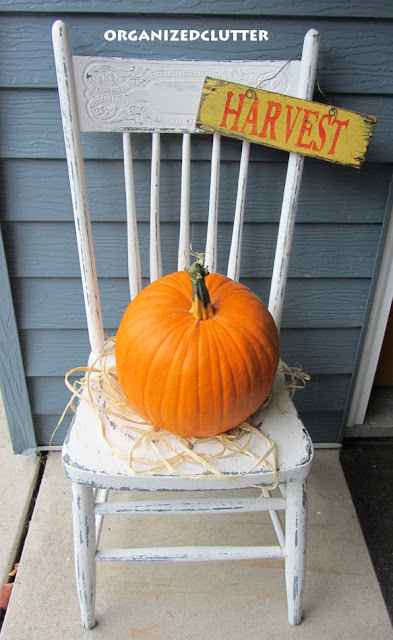 Too early for real pumpkins here, but can't wait to add a few to my decor. It all looks so inviting. 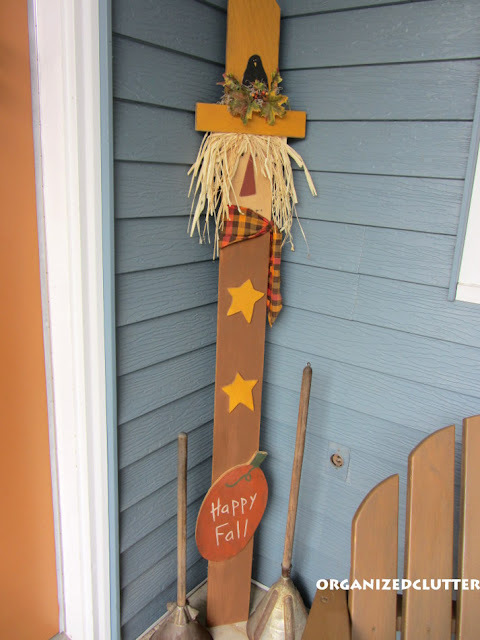 All your fall decorations look so cheerful and pretty! Everything looks so cute! 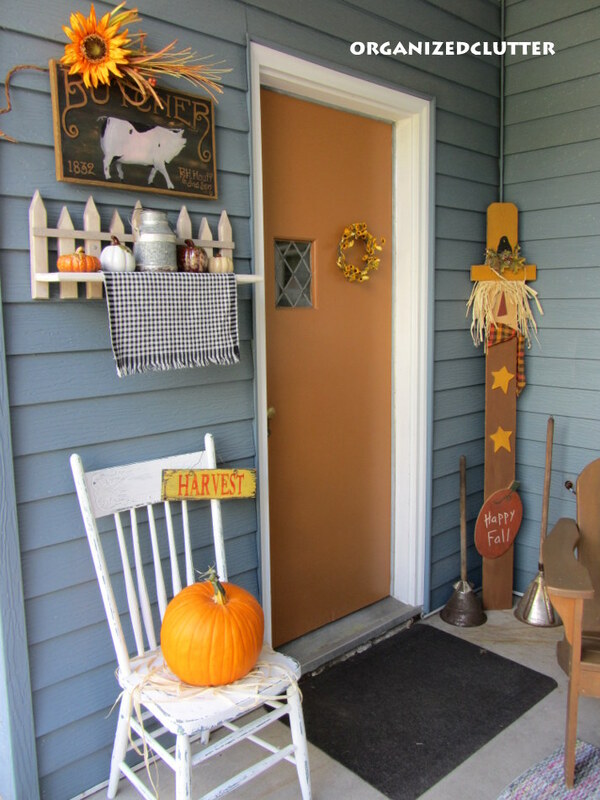 A perfect Fall greeting at your door! Dollar stores always amaze me at what they carry! Cute pumpkins on a cuter shelf, and I LOVE your piggy pic! Your outdoor fall decor looks very welcoming! I need to get busy with mine. This looks so adorable! Very welcoming! Nice job! This is so adorable! Very welcoming and inviting! Nice job! 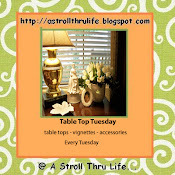 Stopping by via Debbiedoo's. 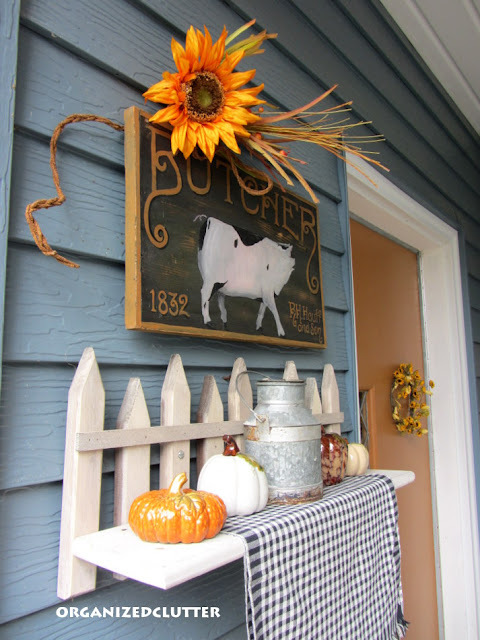 Love your outdoor Fall decor! We had 9 inches of snow on Oct. 30 last year and then only one other snow storm after that!! 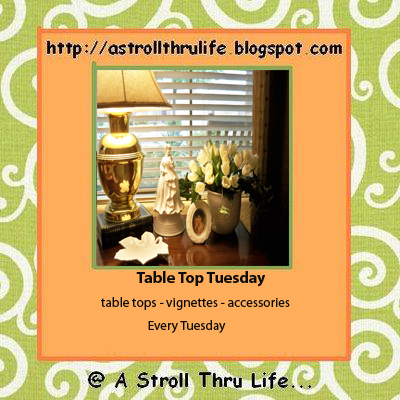 i so wish i had this type of space! 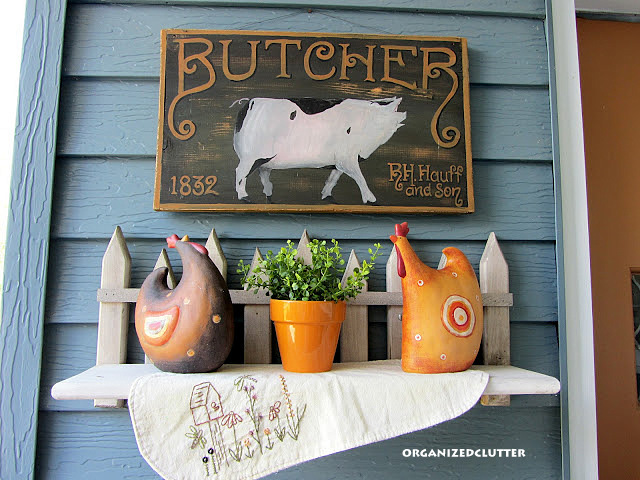 love the way you decorated that shelf! Love how your tweeking took you from one season to another! Love fall decor. What a welcoming home you have! Love all the little touches. So cute! 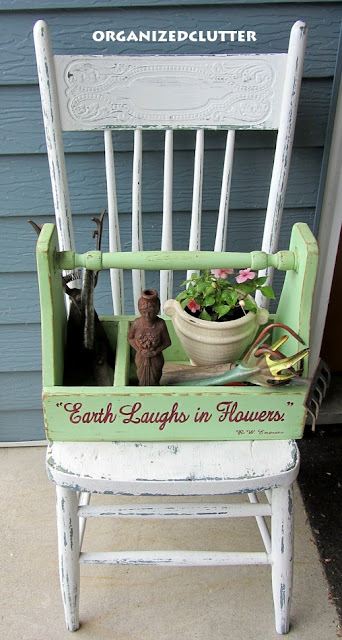 Love the chair and how you can re-use it for the seasons! I know what you mean about having to pack it away right after Halloween. We are in Northern Michigan and the season changes quickly. We have to bundle things up and put things in storage to prepare for the winter. Anyway, your entryway is adorable...enjoy! Your porch is so pretty and inviting. I love the scarecrow in the corner. Your Fall decor is so welcoming. I hope we don't see 37 until next month! That looks so nice! 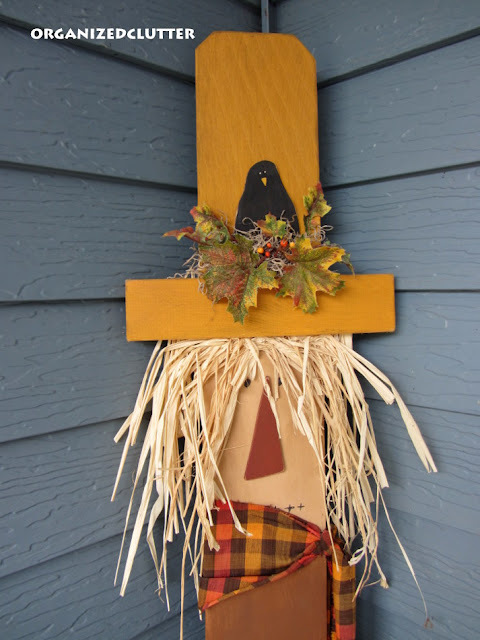 I thought it was too early to put out my scarecrow but I guess its not. I am just waiting for temperatures below the 90's to take this same leap. But I have always loved "the changing of the guard" no matter what season it is.